In Stephen’s first Guest Blog for Q Source, he discusses microscope users’ injuries and discomfort and ways to remedy these issues. 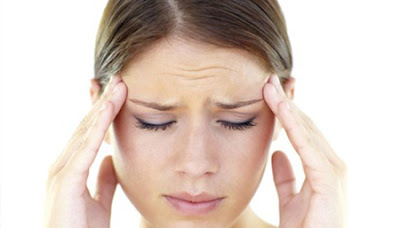 Headaches are a common complaint of microscope users. 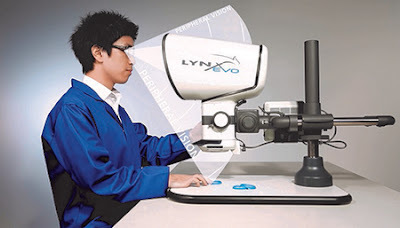 Ask any seasoned microscope user about working with microscopes and they will often have stories of sore necks, headaches and “microscope eye,” seemingly caused by leaning over conventional stereo microscopes for prolonged periods. Such issues not only have a significant effect on users’ comfortable working, but their discomfort also affects concentration and, by association, the ability to perform tasks. While it is hard to attribute every incidence of each complaint with the microscope, it is often the common factor. Specific attention can also be paid to eyepieces. Most conventional stereo microscopes produce a very small and bright exit pupil that requires the user to maintain a fixed viewing position very close to the eyepiece. This leads to areas of poor ergonomics, poor postural ergonomics, and poor optical ergonomics. The requirement for a fixed viewing position can be helped by ensuring that the user’s workstation is correctly configured. To do this work from the ground up, adjust the user’s seat and bench height, have them stand and sample the position so that the final location of the eyepieces does not require the user to overextend or compress the neck. Don’t forget that it is often possible to raise either the sample or the entire stand, if needed. That dusty old text book that sits in the corner unused could be just what is needed to lift the sample to a better working height. For optical ergonomics with eyepiece microscopes the situation is more complicated. Interpupillary distance, diopter adjustment, and eyepiece selection all sound complicated and can factor in the user’s comfort affecting eyestrain and headaches. The answer? Get rid of the eyepieces. 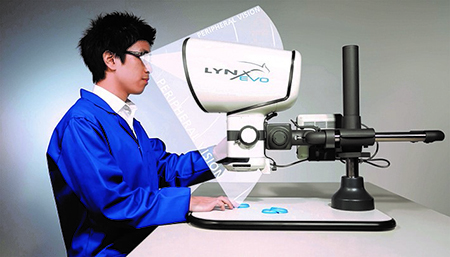 Eyepiece-less systems, such as Vision Engineering’s Mantis and Lynx ranges, are designed with ergonomics at their core. Rather than small, restrictive exit pupils of conventional eyepieces, Mantis and Lynx ranges offer exit pupils that are up to 10 times larger. Those allow users freedom of movement and a natural comfortable working position. designed for user comfort and freedom. When eye comfort is increased, by reducing refocusing and iris activity through a working position that is further from the microscope itself, it allows an equidistant direct view of the subject and inclusion of ambient light into the field of view. Where eyesight correction is necessary, the user can simply use their own spectacles allowing correction for conditions such as astigmatism that cannot be corrected through eyepieces. Good ergonomics lead to comfortable users who are better able to concentrate for longer are less prone to illness or injury, and who experience ease of operation and enhanced ability to perform a task. More importantly, for many users it means that they can go home at the end of the day happy and pain free with the satisfaction of a job well done. In conclusion, consider ergonomics when choosing your next microscope system to reduce user injuries, increase productivity, and ensure that users are at their best on the job. Thank you, Stephen, for those valuable insights into creating a safer, more comfortable environment for microscope users. We look forward to future Guest Blogs from you and Vision Engineering. For information about Vision Engineering's microscope/inspection products, please visit QSource.com. You may also contact us via email or phone at 800-966-6020. If you have questions or comments for Stephen about this Guest Blog, please leave him a message in the comments section. If there's a product or topic you'd like to see The Q Source Resource write about please let us know. We'd also appreciate if you share this blog post with your friends and colleagues via the social media links below.